Lettuce facts, an information sheet for kids cooking activities. 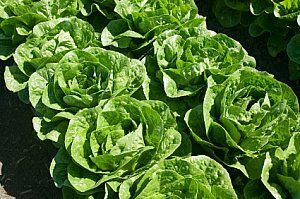 Lettuce facts and general information about lettuce and salad greens. See the picture below. Lettuces grow in the garden from a tiny seed. Pick lettuces that are crisp and have a good color for their variety. Store in refrigerator crisper section. Wash your salad greens and use a salad spinner to dry. 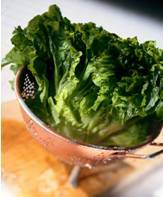 Toss lettuce and greens in salads, sandwiches or garnish plates. Greens are not usually cooked but can be. Look for salad greens that are darker green in color. Iceberg lettuce has little nutritional value. A 2 cups serving size is high in Vitamin A, Vitamin C and Vitamin K.
Stir together cooked macaroni and chopped tomato in serving bowl. Mix dressing together and pour over macaroni and tomato. Cover and chill. Before serving, stir in lettuce and bacon. First, lay tortilla on plate. Spread the Philly cream cheese on the tortilla. Wash lettuce and tear it into to reasonable sizes. Roll up, and ENJOY!! !